* Senior club appearances and goals counted for the domestic league only and correct as of 15:24, 18 September 2016 (UTC). 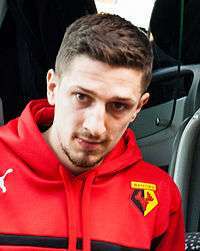 Craig George Cathcart (born 6 February 1989) is a Northern Irish professional footballer who plays as a centre-back for Watford and the Northern Ireland national team. He has also captained his country's under-21 side. A product of the Manchester United youth academy, Cathcart spent time on loan at Belgian club Royal Antwerp, and English Football League Championship sides Plymouth Argyle and Watford, before joining newly promoted Blackpool in 2010. Cathcart returned to Watford in July 2014 on a permanent deal. Born in Belfast, Cathcart was spotted playing football for Glengormley High School at the age of 14, and, despite being coveted by clubs like Arsenal, Chelsea and Rangers upon winning the Northern Ireland Youth Player of the Year award in 2003, he began training at the Manchester United School of Excellence in Belfast. He signed trainee terms at Manchester United in July 2005, and turned professional on his 17th birthday in February 2006. Cathcart became a regular in the Manchester United Under-18s team, and was a member of the Under-17s team that played at the 2007 Northern Ireland Milk Cup, scoring the first goal in a 5–0 win over Liechtenstein. During the 2006–07 season, he was made captain of the United youth team that reached the FA Youth Cup Final, although he missed both legs of the final, the first through selection for the first team and the second through injury. On 19 March 2007, Cathcart received his first call-up to the Manchester United senior squad for the FA Cup Sixth Round replay with Middlesbrough. After an injury to Nemanja Vidić, Cathcart was promoted to the first team squad as cover on 31 March 2007. He was an unused substitute in Manchester United's 7–1 win against Roma in the Champions League less than two weeks later, the FA Cup semi-final victory over Watford a further four days later, and the victory over Sheffield United on 17 April. Speculation that this defensive injury crisis would lead to Cathcart making his senior debut ended when he suffered a season-ending knee injury during training after the match against Sheffield United. As a result, he also missed the second leg of the FA Youth Cup final; he had already missed the first leg due to his call-up to the senior squad. Despite his injury, Cathcart's performances in the club's youth teams earned him the Jimmy Murphy Young Player of the Year award for the 2006–07 season. At the start of the 2007–08 season, Cathcart was sent on a half-season loan to United's Belgian feeder club, Royal Antwerp, to gain match experience. He made his debut for the Belgians on 22 September 2007, in a match against OC Charleroi. The next game saw Cathcart score Antwerp's only goal of the game in a 4–1 loss to Kortrijk. He scored again in a match against Tubize, to earn a 1–1 draw, and also the Man of the Match award. He made a further nine appearances for "The Great Old", to bring his total to 13, before returning to Manchester United at the end of 2007. Although he was not originally selected for the squad, Cathcart was briefly called up to the Manchester United first team for their tour of South Africa on 24 July 2008, and played the full 90 minutes in the team's 4–0 victory over Kaizer Chiefs on 26 July, his first appearance for the first team. He then came on as a 66th-minute substitute for Jonny Evans in a match against Portsmouth in Nigeria the following day, before then coming on for Wes Brown at half-time in a friendly against Peterborough United on 4 August. On 8 August 2008, in a search for first-team football, Cathcart joined Championship side Plymouth Argyle, on loan until the end of 2008. This was later extended to the entire 2008–09 season, as Cathcart has quickly become a regular at Home Park. He scored his first Plymouth goal in their 3–1 defeat at home to Ipswich in October 2008. Cathcart returned to Manchester United at the end of the 2008–09 season and played in two pre-season friendlies for the reserve team before joining up with the first team for the Audi Cup in Munich. After Nemanja Vidić suffered a calf strain in the warm-up before the semi-final against Boca Juniors, Cathcart was promoted to the starting XI. Manchester United won the match 2–1, with Cathcart giving a good performance, although he did head the ball against his own crossbar mid-way through the second half. Cathcart scored the opening goal in a 3–1 away win over Bolton Wanderers in the first game of the 2009–10 Premier Reserve League season on 24 August 2009. The following season, Cathcart was sought after by a number of Championship sides, and Manchester United received a bid of £1.25m from a Championship side but United preferred a loan deal. Plymouth Argyle and Ipswich Town both showed an interest in the young defender, but he instead signed for Watford on loan until 4 January 2010, where he joined fellow Old Trafford team-mate Tom Cleverley and Arsenal youngster Henri Lansbury on loan. On 11 August 2010, Cathcart signed for Blackpool for an undisclosed fee, after agreeing a three-year contract, with an option for a further year. Three days later, he made his debut as Blackpool marked their Premier League debut with a 4–0 win over Wigan Athletic at the DW Stadium. He scored his first goal in the Premier League with a powerful header against his former club, Manchester United, at Bloomfield Road on 25 January 2011; the 15th-minute goal opened the scoring for the match, but Blackpool went on to lose 3–2. On 24 June 2014, Cathcart agreed terms on a two-year deal with Watford having been out-of-contract at Blackpool. He officially became a Watford player on 1 July. Cathcart has been involved with the Northern Ireland national team since Under-17 level, and was part of the team that attempted to qualify for the 2006 European Under-17 Championship. By November 2006, still just 17 years old, Cathcart had been promoted to the Northern Ireland Under-21 team, and was named in the squad for a friendly against Germany on 14 November 2006. In February 2007, Cathcart was selected in the European squad for the 2007 UEFA-CAF Meridian Cup, a competition between two "all-star" Under-18 teams from Europe and Africa. Since his first call-up, Cathcart has been a regular name in Northern Ireland Under-21 squads, and has so far made seven appearances for the team, the most recent being a 3–0 defeat by Germany on 5 September 2008. Cathcart was called up to the Northern Ireland squad in May 2009, along with nine other uncapped players for the international friendly against Italy on 6 June. Cathcart made his full international debut in Northern Ireland's 1–0 win against Slovenia in Maribor on 3 September 2010. Playing out of position at left-back, due to an injury to Jonny Evans, Cathcart put in a strong performance and set up the winning goal for Corry Evans. The Watford player scored his second international goal in a 1-1 friendly draw away to Wales in March 2016. 1 2 3 Hugman, Barry J., ed. (2010). The PFA Footballers' Who's Who 2010–11. Mainstream Publishing. p. 79. ISBN 978-1-84596-601-0. ↑ "Craig Cathcart". premierleague.com. Premier League. Retrieved 15 March 2011. ↑ "Cathcart tipped for the top". BBC Sport. 14 May 2003. Retrieved 13 October 2007. ↑ "Fitzmaurice hits four for Orchard". BBC Sport. 31 July 2006. Retrieved 9 November 2008. ↑ Bartram, Steve (19 March 2007). "Report: United 1 Boro 0". ManUtd.com. Manchester United. Retrieved 10 November 2008. ↑ Hibbs, Ben (16 April 2007). "FAYC: Liverpool 1 United 2". ManUtd.com. Manchester United. Retrieved 10 November 2008. ↑ Coppack, Nick (25 April 2007). "Youth Cup Final: Show your support". ManUtd.com. Manchester United. Retrieved 9 November 2008. ↑ Mercer, Nathan (19 March 2007). "Man Utd 1–0 Middlesbrough". BBC Sport. Retrieved 9 November 2008. ↑ Bartram, Steve (31 March 2007). "Vidic injury blow confirmed". ManUtd.com. Manchester United. Retrieved 10 November 2008. ↑ Bevan, Chris (10 April 2007). "Man Utd 7–1 Roma (agg 8–3)". BBC Sport. Retrieved 9 November 2008. ↑ McNulty, Phil (14 April 2007). "Watford 1–4 Man Utd". BBC Sport. Retrieved 9 November 2008. ↑ McNulty, Phil (17 April 2007). "Man Utd 2–0 Sheff Utd". BBC Sport. Retrieved 9 November 2008. ↑ Coppack, Nick (21 April 2007). "Injuries continue to mount". ManUtd.com. Manchester United. Retrieved 10 November 2008. ↑ Bartram, Steve (30 August 2007). "Youngster heads to Antwerp". ManUtd.com. Manchester United. Retrieved 9 November 2008. ↑ Thompson, Gemma (26 July 2008). "Boss hails Vodacom triumph". ManUtd.com. Manchester United. Retrieved 10 November 2008. ↑ "Cart Before The Start". pafc.co.uk. 8 August 2008. Retrieved 8 August 2008. ↑ "Plymouth 1–3 Ipswich". BBC Sport. British Broadcasting Corporation. 25 October 2008. Retrieved 24 August 2009. ↑ "Cathcart revels in senior start". ManUtd.com. Manchester United. 30 July 2009. Retrieved 30 July 2009. ↑ "Antonio aces Reds bow". ManUtd.com. Manchester United. 29 July 2009. Retrieved 30 July 2009. ↑ "Boca Juniors 1 United 2". ManUtd.com. Manchester United. 29 July 2009. p. 3. Retrieved 30 July 2009. ↑ Bartram, Steve (24 August 2009). "Reserves: Bolton 1 United 3". ManUtd.com. Manchester United. Retrieved 14 September 2009. ↑ "Cathcart joins the Hornets". watfordfc.com. Watford FC. 14 September 2009. Retrieved 14 September 2009. ↑ "Blackpool sign quartet ahead of Premier League debut". BBC Sport. British Broadcasting Corporation. 11 August 2010. Retrieved 11 August 2010. ↑ Sanghera, Mandeep (14 August 2010). "Wigan 0-4 Blackpool". BBC Sport. British Broadcasting Corporation. Retrieved 2 September 2013. ↑ McNulty, Phil (25 January 2011). "Blackpool 2-3 Man Utd". BBC Sport. British Broadcasting Corporation. Retrieved 2 September 2013. ↑ "Craig Cathcart: Watford sign Blackpool defender". BBC Sport. 24 June 2014. Retrieved 28 June 2014. ↑ "OFFICIAL: Cathcart Returns". watfordfc.com. 24 June 2014. Retrieved 1 July 2014. ↑ "NI Under-17 European hopes dashed". BBC Sport. 28 March 2006. Retrieved 10 November 2008. ↑ "Millar names squad for Germany". BBC Sport. 10 November 2006. Retrieved 10 November 2008. ↑ "Europe's Meridian squad selected". UEFA.com. Union of European Football Associations. 21 February 2007. Archived from the original on 19 February 2008. Retrieved 9 November 2008. ↑ "Germany 3–0 Northern Ireland – Lineups". uefa.com. Union of European Football Associations. 5 September 2008. Archived from the original on 1 November 2007. Retrieved 10 November 2008. ↑ "Irish League quintet in NI squad". BBC Sport. British Broadcasting Corporation. 20 May 2009. Retrieved 21 May 2009. ↑ "Slovenia 0–1 Northern Ireland". BBC Sport. 3 September 2010. Retrieved 4 September 2010. ↑ "Spelersstatistiek Craig Cathcart" (in Dutch). R.A.F.C.-Museum. Retrieved 17 June 2014. Wikimedia Commons has media related to Craig Cathcart.